Chevrolet showcased the Trailblazer SUV at the 2012 Delhi Auto Expo for the first time. Since then, after a lot of testing, Chevrolet is ready for the launch. The company has confirmed October 2015 launch for the big SUV which will be taking on the Toyota Fortuner, Mitsubishi Pajero, Ford Endaevour. However, the SUV will be focussed more on people driving it on tarmac rather than in mud, as the company has decided to bring in only one variant of the car which will be a 2WD version only. The 7- seater SUV will be powered by 2.8-litre Duramax DOHC turbodiesel engine good for 197bhp and a massive 50.99kgm of torque. Trailblazer will come with an automatic gearbox only. 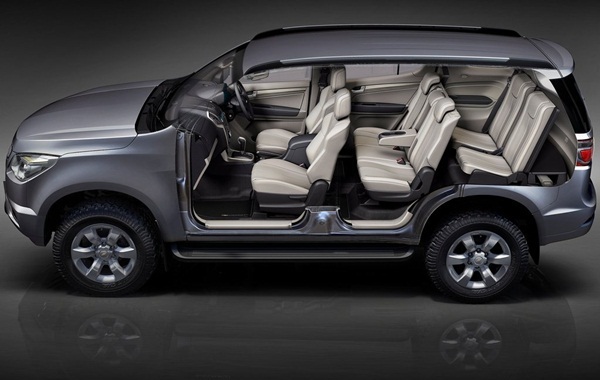 Priced between 25-30 lakhs, the Trailblazer will boast of features like Electronic Stability Control, Anti-lock Braking System, Hydraulic Brake Assist, Traction Control, Dynamic Rear Brake Proportioning, Electronic Brake-force Distribution, Panic Brake Assist, Engine Drag Control, Hill Descent Control andDriver and Occupant Air Bags. Tata Motors Keeping Off 800cc Oil Burner For Time Being, Aiming For A Bigger Diesel Engine?